It's hard to imagine a better time for Dell to go public. Not just because of what equity markets look like today, but because of where Dell's business and industry conditions stand. Not as simple, however, is the argument for buying out the estimated 20% of VMware shares that Dell doesn't already own, given the massive rally that VMware (VMW - Get Report) has seen over the last two years. But if the goal of Dell's apparent review of "strategic alternatives" is to put the company on better long-term footing, it might feel that owning as much of VMware as possible is in its interests. Reuters, Bloomberg and The Wall Street Journal have each reported that Dell, which was taken private in 2013 and bought storage giant EMC in 2016, is exploring an IPO and other strategic options. Among those options: Taking full ownership of VMware; exploring a sale or IPO for Dell's Pivotal Software unit (Dell was reportedly told by bankers last year that Pivotal, which provides popular software tools for cloud developers, could be worth $5 billion to $7 billion); and acquisitions that (per Reuters) would "boost [Dell's] cash flow and expand its offerings." Bloomberg and Reuters note Dell's board will review its options at a meeting later this month. It's possible that someone inside of Dell, or at a bank working for the company, leaked the news to feel out how public investors might react to a Dell IPO or other moves. On Friday, VMware's shares rose 9% to $150 on the news. The virtualization software giant now sports a roughly $60 billion valuation, and has seen its shares mores than triple from their early-2016 lows. On the other hand, the Dell Technologies (DVMT tracking stock, which is meant to track part of Dell's VMware stake (equal to a 53% interest in VMware), is down 10.1% to $79.53 on worries about what Dell's plans could mean for the stock. Needless to say, the massive tech rally seen over the last two years is likely on Dell's mind as it mulls an IPO. If Dell's original going-private deal -- led by Michael Dell and PE firm Silver Lake -- was seen as a buy-low opportunity for an under-appreciated asset, this could very well be seen as a sell-high moment. That's especially true since the tech IPO market has heated up: Several enterprise-focused tech firms had solid 2017 debuts, and tech unicorns such as Dropbox, Spotify, SurveyMonkey and Careem have either been reported to have confidentially filed for IPOs or to be mulling offerings. And as all the reports note, the proceeds from a Dell IPO could help the company lower the massive debt load it took on through the take-private and EMC deals. As of Nov. 3, Dell had $51.6 billion in debt, partly offset by $13.7 billion in cash and short-term investments. An IPO could also conceivably help pay for VMware share purchases or a 10-figure security, software or storage acquisition. Also potentially motivating Dell to consider an IPO: Its PC and server businesses are in pretty good shape right now, but it's not guaranteed they'll stay that way. With the help of aggressive pricing and a solid notebook lineup, Dell's PC unit share rose from 14.2% to 15.7% in 2016, and ticked higher to 16.1% in 2017, according to research firm IDC. At CES, new laptops for Dell's XPS 2-in-1 notebook line received a lot of good publicity, as did the company's Mobile Connect software for pairing Windows PCs with iOS and Android phones. As for Dell's server business, IDC estimates its revenue share jumped to 18.1% from a year-ago level of 15.7% in Q3, with revenue rising 38% to $3.07 billion. 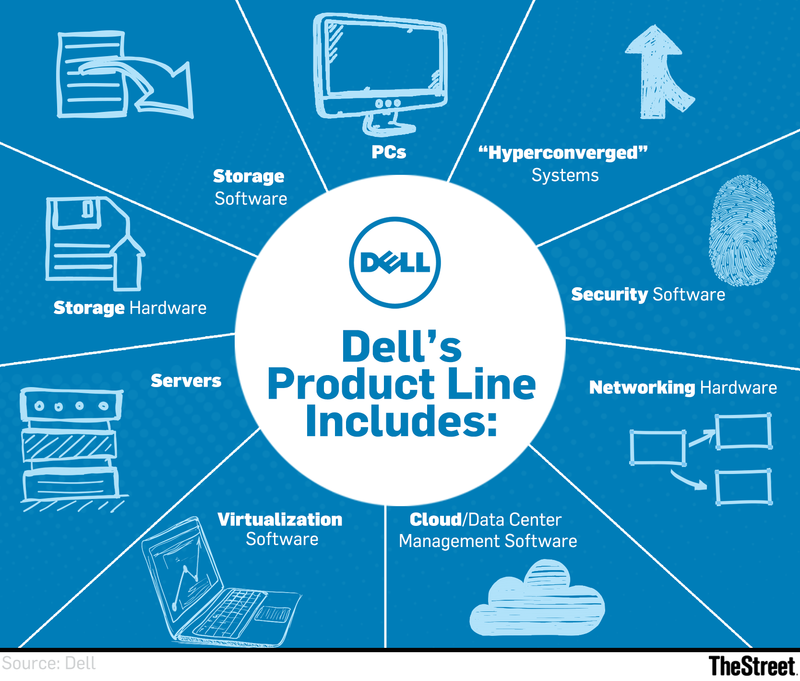 Dell reported that its server and networking revenue rose 32% annually during its October quarter to $3.85 billion. While an enterprise upgrade cycle driven by an Intel (INTC - Get Report) server CPU refresh helped, it also helped that Dell -- unlike rivals such as HP Enterprise (HPE - Get Report) and Cisco Systems (CSCO - Get Report) -- is believed to be selling huge volumes of servers to cloud giants, courtesy of its Extreme Scale Infrastructure unit. But selling servers to cloud giants is widely seen as a low-margin business; those companies tend to buy modular servers based on internal or open-source designs, and are often comfortable relying on Asian contract manufacturers such as Quanta and Compal to act as their suppliers. HPE threw in the towel on this market after a major client (believed to be Microsoft (MSFT - Get Report) ) cut its orders significantly, and there's no guarantee that Dell won't see a big client do the same thing down the line. Meanwhile, cloud infrastructure adoption will remain a long-term headwind to enterprise server demand. Jim Cramer and the AAP team hold a position in Microsoft for their Action Alerts PLUS Charitable Trust Portfolio. Want to be alerted before Cramer buys or sells MSFT? Learn more now. And while Dell's PC business is humming along for now -- the company's PC division saw its revenue rise 8% in the October quarter to $10 billion -- the industry as a whole remains sluggish, as upgrade cycles continue lengthening for both consumers and businesses. Following a rough 2016, IDC believes global PC shipments were roughly flat last year at 259.5 million. Gartner thinks they fell 2.8%. While PC and server sales are good for now, Dell's storage business is struggling. During its October quarter earnings call, the company noted that its storage orders declined by a mid-single digit percentage, as healthy demand for systems based on newer architectures was offset by weak demand for EMC's older storage lines. IDC believes Dell's enterprise storage revenue share fell to 18.8% in Q3 from 21.1% a year earlier. Though it has innovative offerings in fields such as all-flash arrays and scale-out storage, Dell has been facing stiff competition from NetApp (NTAP - Get Report) and IBM (IBM - Get Report) , as well as from upstarts such as Pure Storage (PSTG - Get Report) . And as with servers, cloud adoption is weighing on enterprise demand. An IPO would provide Dell with both funds and a publicly-traded stock that it could use on an acquisition to help shore up its storage position. Or alternatively, to make a big acquisition that lowers the company's PC and storage dependence, and increases its exposure to growing software and/or security markets. Taking full ownership of VMware would be another way to do this. VMware is coming off an October quarter during which its license revenue rose 14% annually to $785 million, as strong demand for its networking virtualization, storage virtualization and enterprise mobility offerings helped offset ongoing declines in its mainstay server virtualization business. But thanks to VMware's big run-up, buying out the company's minority holders wouldn't come cheap. Following its Jan. 26 gains, VMware trades for 27 times a fiscal 2019 (ends in Jan. 2019) EPS consensus of $5.59. Regardless, this certainly feels like the right time for Dell to rejoin the ranks of publicly-traded companies. If it waits a year, the investor reception could possibly be much chillier for multiple reasons.